Becoming adaptable on the road. One of my favorite aspects of travel is that it makes me more adaptable. When I had an apartment, local friends, and a steady Internet connection there were many things that I could control: things that I could make perfect if I just put enough time into them. Today almost nothing is in my control. I can’t know if I’ll get a good night’s rest, can’t figure out if a meal will fill me up before I order it, and have a lot of trouble eating healthily1. Some of my desire for control comes out with rather obsessive selection of gear, but a bunch of it is lost in all the shuffle of moving around constantly. I have the kind of mind that likes to solve problems. On the road a lot of those problems have to go unsolved. I’m realizing that I don’t need a perfect solution to problems. I don’t always need to wear clean clothes or be dry or warm or cool. I’m learning to train my brain to ignore minor discomfort and pain in order to make life more pleasant. I think that we get so used to having things working just right, just perfectly, that we lose track of what we actually need. It’s possible to let the tiny things that are going wrong and frustrating us dominate our time. We obsess over these tiny problems and try to fix them, or aren’t even aware of them until a product on Kickstarter tempts us to solve them with money. Today I could spend hours reading about lenses instead of just going out and shooting pictures, I could spend a similar amount of time trying to plan out the perfect trip to a new town, stay in the perfect hotel, or eat the best local food. Or I can just go there and see what I like and try to smile when things don’t turn out right. As I’m writing this it’s late at night, there’s loud music coming through my door, and mosquitoes are biting me on the ankles. To stay productive on the road I’ve had to learn not to care and just sit down and work. One of my favorite books is On Writing by Stephen King. In the book King stresses that you can’t make your working environment perfect and eventually you just have to sit down and get to work. He writes in a windowless room facing the wall so that his mind has to create a world for him. To me that’s perfect adaptability: just sitting down and making yourself do something instead of endlessly fussing over getting it just right. 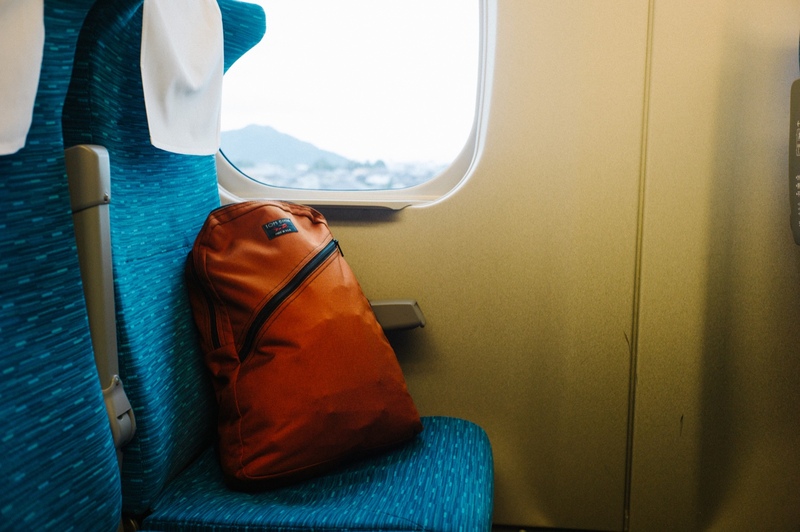 The picture is a Tom Bihn Daylight on a Shinkansen bullet train in Japan. Of the things I like to adapt to, bad gear isn’t one of them. Tom Bihn graciously sent me this pack to review in Kyoto. So far I love the pack but want to use it as my primary pack for a while before giving a full review.